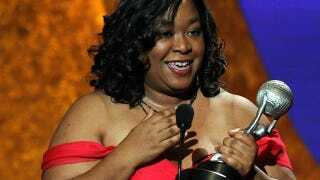 According to The Hollywood Reporter, Shonda Rhimes has sold an hour-long drama to ABC that is part soap opera and part conspiracy thriller. The Circle follows ten friends, adopted as children by a billionaire philanthropist, who begin to question their past when one of their own is murdered. It's genius, really. Everyone loves orphans! From Annie to les enfants Jolie-Pitt. (Imagine if grown-up versions of Zahara, Maddox and Pax were cast!) Plus, everyone loves mysteries. And if we're looking at a large, multi-racial cast — a la Grey's Anatomy and Lost — that's even better. Rhimes — who is the creator, head writer, and executive producer of Grey's and Private Practice — has been nominated for an Emmy three times, and has more lady-centric programming in the works: In August she sold a "period luxury hotel drama" to ABC — who wouldn't watch the crap out of that? She also sold a show called Wildwood to Fox — in which "a wise-beyond-her-years teenager who poses as an adult in order to land a job at a bar on the Jersey Shore." She's also working on a Washington DC-oriented program. So! Perhaps the answer to "what does a woman really want from a TV show" is "a woman coming up with great concepts."